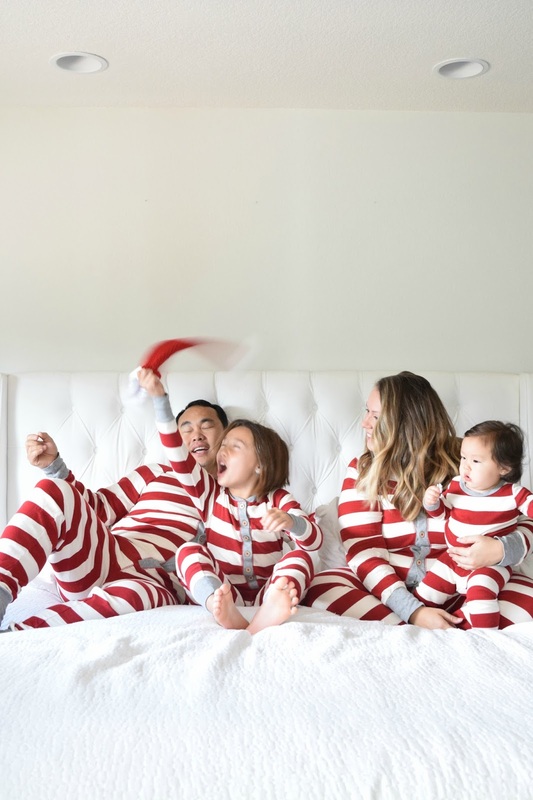 We’ve never taken Christmas pictures as a family or sent out Christmas cards but since welcoming our daughter earlier this year, I really wanted to make it happen and start creating traditions as a family that they’ll remember growing up and perhaps carry into families of their own one day. 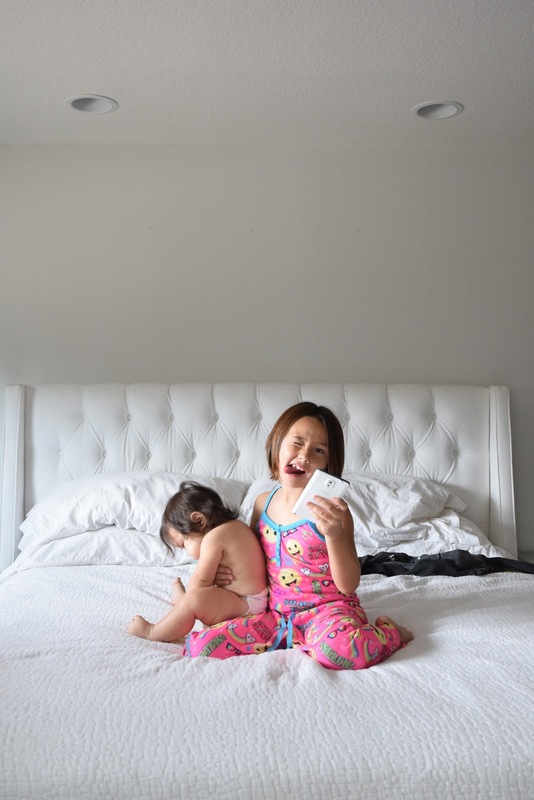 I thought about hiring a photographer for a hot minute but then decided against it knowing that the current dynamics of our family (a never-not-moving baby and a super silly 8 year old) were better suited for pictures at home where they felt comfortable and relaxed. 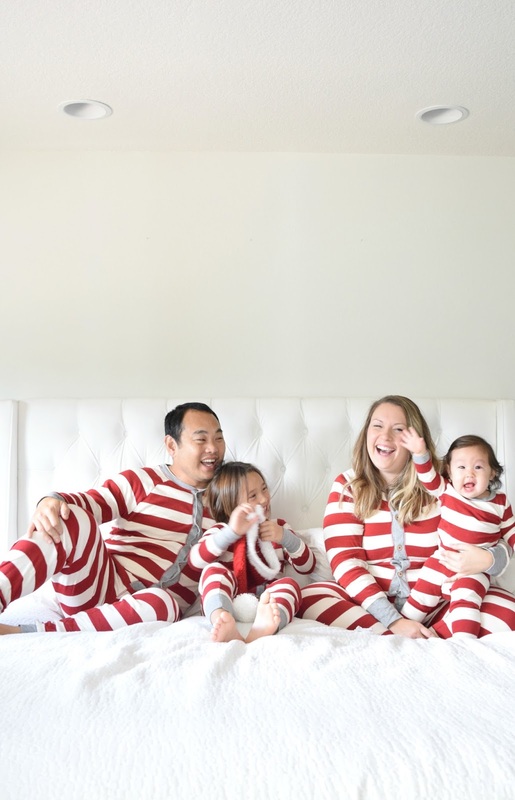 It was hard work, but I’m so glad we committed to at home family pictures, in matching jammies no less, despite my nerves and hesitation about getting a “good enough” photo for our first ever family Christmas card. Make sure the outfits are washed, ironed, and looking spiffy – whatever you need to get you and your family photo ready! It’s also great idea to think about your photo layout ahead of time. Do you want a horizontal or vertical card? Where will your holiday greeting go? Be sure to leave enough “open space” in your photo for that festive holiday greeting. 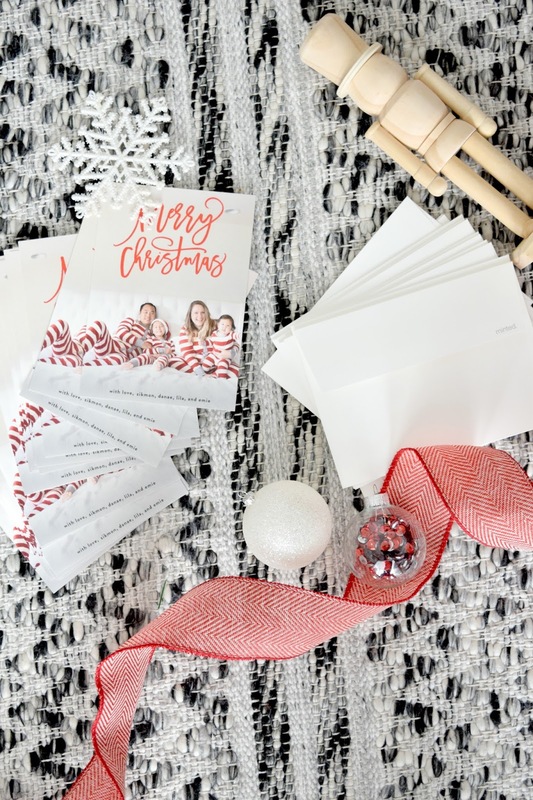 Thinking about these details ahead of time will force you to think about the composition of your photo before it goes to print – last thing you want is a holiday greeting that goes across someone’s face. 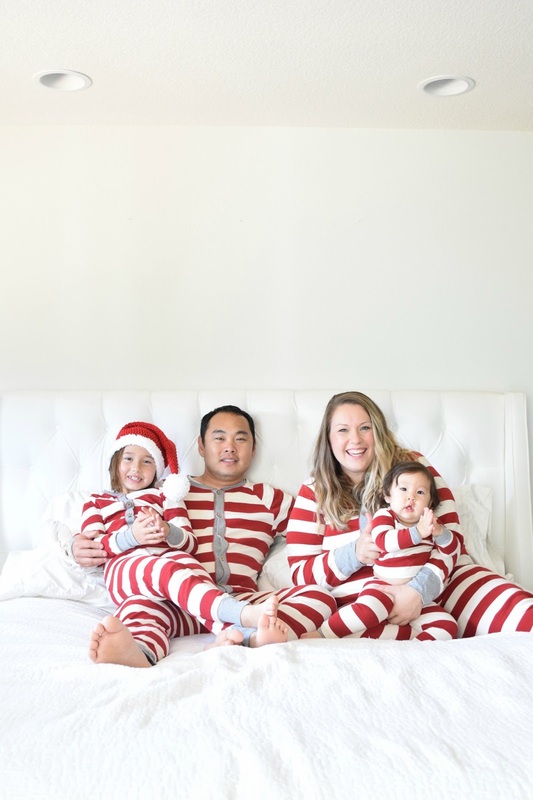 Be thoughtful when choosing the time to take your family pictures. For us that meant after Emie’s morning nap. She needs that extra 1-2 hours of rest before she’s up and ready to go for her longest stretch of awake time. Make sure everyone is well feed and not hangry too – adults included! While the baby was napping everyone else dressed in their jammies and once she woke up we dressed her, and gave her a bottle (no one wants a hangry baby) while I pulled back and drapes and took a few test shots to make sure the lighting was right. Once you’ve set everything up – let your tools do the work! I have this tripod and it comes in handy for these exact situations. I also use this IR Camera Remote app that we just downloaded to my phone – easy peasy. We set the remote up so that it was voice controlled and we probably snapped close to 300 pics by voice only. It started out innocently enough with us adults yelling cheese! or smile! but then our silly 8 year old wanted in on the fun and started yelling poop! and fart! and before you know it, we were cracking up! But when the baby started screaming and shouting to snap a pic, we laughed so hard we cried. It’s hard to snap a family picture and expect perfection especially when little ones are involved. 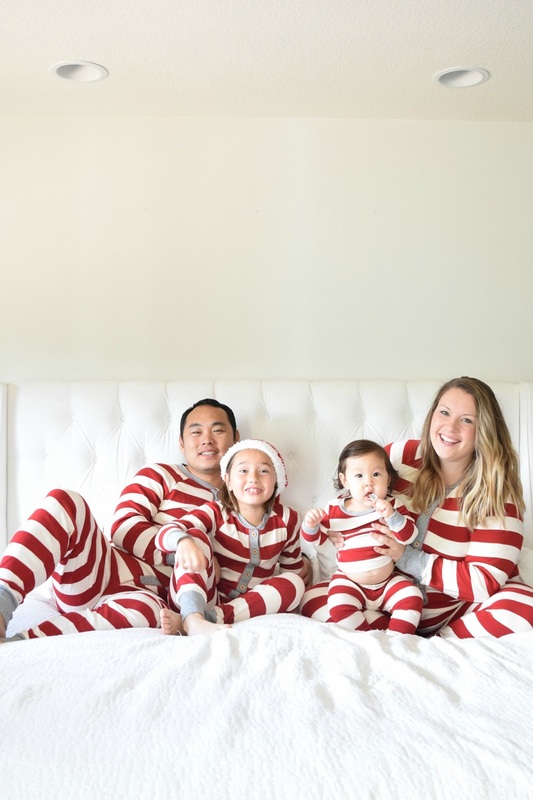 The kids were supposed to wear matching santa hats but the baby refused to keep it on. We tried to put a bow in her hair instead but she kept pulling it out and chewing on it. You win some, you lose some but I didn’t let it ruin the mood or our pictures. But other times…she was just her silly 8 year old self and got a little carried away with that Santa hat. 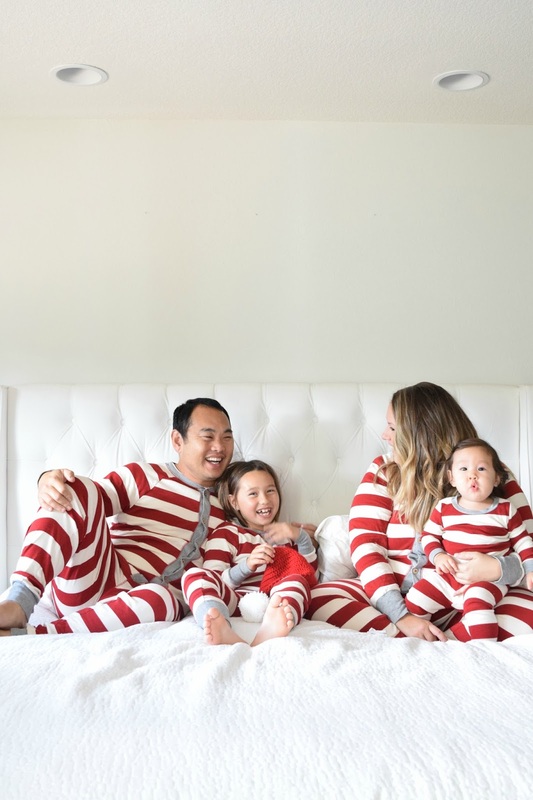 All in all, I call it a success and look forward to many more years of family Christmas photos – but how will we ever top the matching jammies? 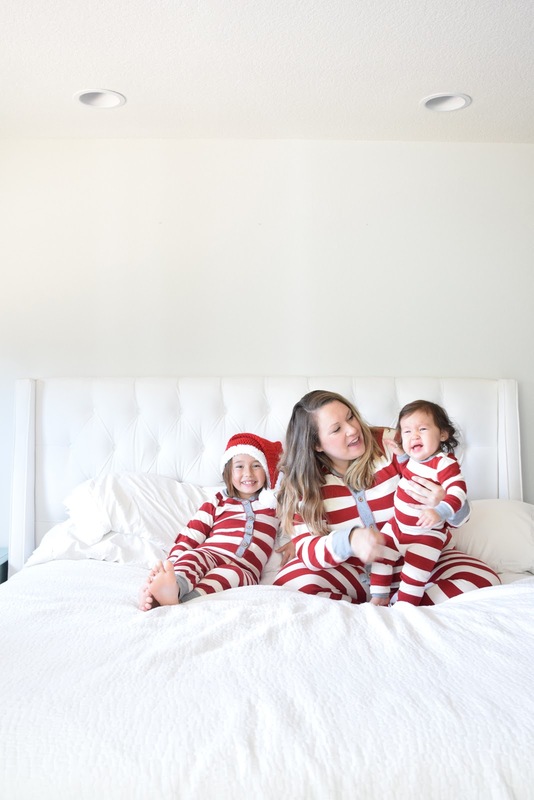 I hope my tips for taking your own family photos help next time you try to tackle this daunting task and if you have any helpful hints of your own, please be sure to share in the comments below! We could all use a little help, amiright? 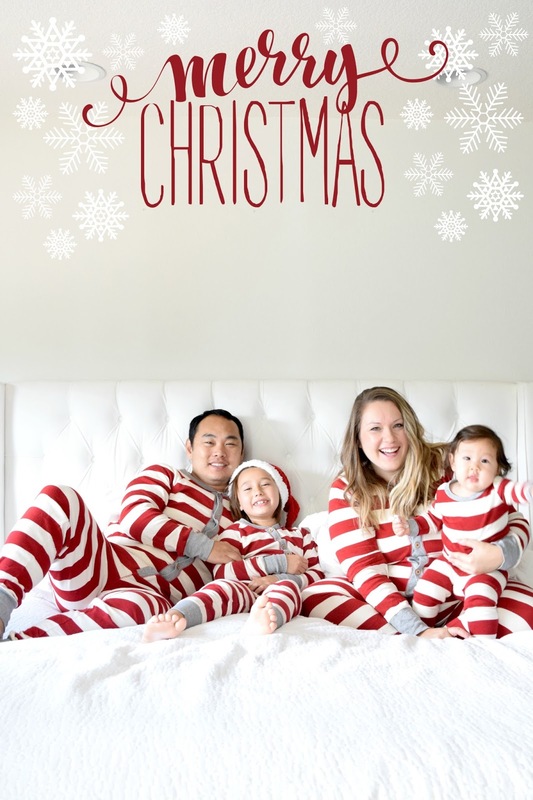 From my family to yours – we wish you all the merriest Christmas! 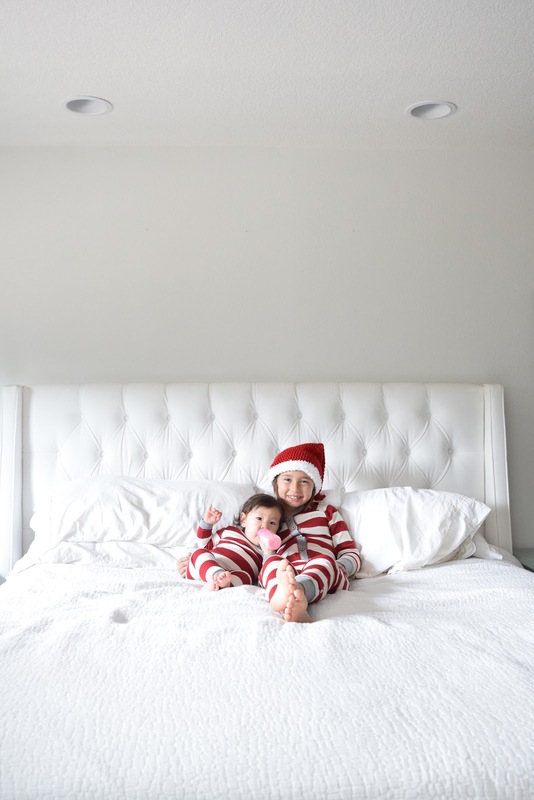 2017 has been nothing short of amazing – we welcomed our littlest babe and we’ve continued making this house our home while occasionally sharing our progress along the way here. As we leave 2017, I couldn’t be more grateful to celebrate this Christmas with friends, family, and watch the magic of Christmas through our daughter’s eyes. If you’re an old friend or new here, thank you for all the support and encouragement along the way. See you in 2018!